A common cause of pain in one or both legs is a pinched or irritated nerve in the low back – a condition commonly referred to as “sciatica”. Symptoms most commonly involve pain in buttock, extending into the back or outside of the thigh, into the shin or calf, and often times into the foot. There are a variety of causes for a nerve in your back becoming irritated or pinched, but the most common reason by far is a herniated disc in the low back. A disc herniation simply refers to a fragment of disc that has moved into an area in the spinal canal where it doesn’t belong. Because there are nerves immediately behind each disc in the low back, disc herniations commonly result in pressure on these nerves, and ultimately, “sciatica”. If you have this condition, the first thing to know is that most patients will go on to have complete resolution of symptoms without surgery. However, in situations where pain has been ongoing or severe despite appropriate nonoperative treatment measures, or if a progressive neurologic deficit is occurring, surgery may be indicated. If surgery is ultimately required, it is generally in the form of a minimally invasive microdiscectomy procedure, whereby the portion of the disc irritating the nerve is removed. This is generally a 1-hour, outpatient surgery with excellent outcomes. 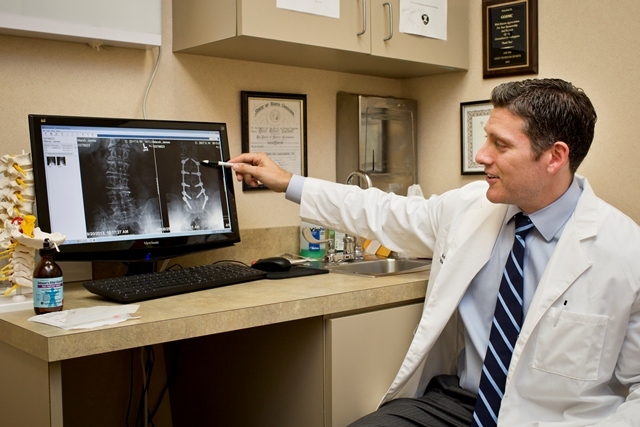 If surgery were ultimately decided upon, our board-certified spine specialist at Guilford Orthopaedic and Sports Medicine Center, Dr. Mark Dumonski, will discuss in detail the specifics of the surgery, as well as the associated risks, alternatives, and the expected recovery time. Questions are always encouraged, and if additional questions were to arise after your office visit, please call the office. A return call from either Dr. Dumonski, his physician assistant Kayla, or one of his medical assistants can be expected within 24 hours of your call. Read more on Disc Herniations by clicking here.